Once again Palestinian students from the hell of the Holy Land face impossible odds as they take on top Western universities at the Silverstone race circuit. Young Palestinian journalist Joumana Imad, writing in Al-Monitor, reports that engineering students from An-Najah National University in Nablus (the West Bank) will be competing against 100 other teams from around the world in the 2018 Formula Student race car competition at the UK’s Silverstone circuit, the home of Formula One. What makes the contest so interesting is that the An-Najah car is made from recycled components due to scarcity and high cost of new parts and materials in the Palestinian territories under Israeli military occupation. Everything has had to be locally sourced, nothing imported. I am so proud that we were able to build this car from scratch with our own effort and money, without any help. We have so much talent and ability that can be tapped to finish projects and manufacture cars but we need financial and moral support to materialize our ideas. The manufacturing cost was about $5,000, which we paid for ourselves. This is a small amount to make a high-standard car that has qualified to participate in an international competition. But we did it. We are eager to represent Palestine abroad. “Inspirational” race car heroes from Gaza went unrecognised. That must not happen again. The event, now in its 20th year, aims to inspire young people and boost skills in advanced engineering. It also teaches management, marketing and people skills. The motorsport industry regards Formula Student as an ideal standard of achievement for making the transition from college to workplace. The An-Najah team follow in the footsteps of students from Gaza who in 2011 took part in the same competition, bravely pitting their race-car design against the sophisticated machines of Western technical universities despite being obstructed by Israel from importing the necessary components. They built their car with bits and pieces salvaged from local scrapyards. It really is inspirational to see a team working so hard with the odds stacked against them like this. Formula Student is a massive challenge in its own right, but to be working with almost entirely recycled parts in one of the most deprived areas in the world is remarkable. These students epitomise the spirit and inventiveness of those who take part in Formula Student. Sadly, I’m posting this article without any contributions from the main players – the General Union of Palestinian Students UK who (presumably) hosted the Gaza team while in Britain, the Palestinian Embassy in London, and the team itself. The reason? After several requests the union said it was “too busy” to give me the team’s contact details. The embassy has not, as far as I know, issued any press releases or briefings, although it did reproduce a Daily Telegraph report on its website. I have written twice asking the ambassador’s office for information and contact details only to be ignored. After combing the internet I found a general email address for KYTC (Khan Younis Technical College). Two emails have been sent but not acknowledged. The story is scraped together from other sources. Had I known about it last summer, I’d have been at Silverstone cheering them on. The problem, as always, is that the people who ‘run’ Palestine — whether Hamas, the Palestinian Authority or the PLO — are pathetic at managing media relations and downright lazy about seizing media opportunities. It was UNWRA (the United Nations Relief and Works Agency) who eventually provided me with basic information. 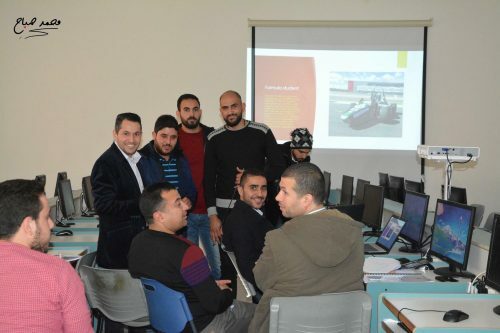 Now Palestinian youth is making a second technology bid for recognition in the outside world. So here’s a prod in the backside to the uncommunicative PA and PLO. Don’t let those youngsters down again. Reach out with news and briefings to those who are likely to use it, including us justice seekers in the alternative media. Act as if you really want independence. This year’s Formula Student event takes place on 11-15 July with four days of competition at Silverstone, where the teams will showcase their custom-built race cars and compete in static and dynamic tests. Construction and use of the car itself has to conform to more than 100 pages of stringent rules and regulations. A four-stroke piston engine no larger than 710cc is used, and this is enough to catapult the car from 0 to 60mph in just a few seconds. But nowadays conventional IC engines go wheel to wheel with electric or hybrid powered vehicles. The cars are judged in a series of tests that include technical scrutiny and an examination of cost and sustainability, presentation, and engineering design. They are also put through performance and endurance tests on the track. The year the Gaza team went to Silverstone the University of Stuttgart won. Stuttgart, as readers will know, is home to Mercedes-Benz and Porsche, so it’s no surprise that the University is renowned for its advanced automotive engineering. The Khan Younis Training Centre (KYTC) in Rafah at the southern end of the Gaza Strip, however, has no such iconic, cutting-edge benefactors on its doorstep. Nor does Najah. After finalising the plans for their car and identifying the parts they needed the Gaza students contacted various suppliers around the world, only to be turned down time and again. Eventually a firm in Italy agreed to help, but when the parts were sent the Israelis refused to let them into Gaza, slamming the door as usual on any opportunity for the prisoners of Gaza to shine. Consequently they missed the deadline for their design and specification report and were docked a huge number penalty points. So the team had to improvise by salvaging parts from old cars and machinery. The engine came from a used Honda motorcycle and the chassis was fabricated with domestic hot water pipes. This and the lack of sophisticated tools was hardly a recipe for ultimate success. Nevertheless their efforts earned considerable praise. Anticipating that the enterprising lads from Gaza would be back in 2013, I spoke to the Lola factory which had been building race cars for 50 years, including Formula One, Formula 2, Formula 5000 and Le Mans machines. They responded with enthusiasm saying: “We will do whatever it takes to get this group a great experience here. We will do a tour for them and it will be a very educational and fun tour.” What’s more they were happy to receive staff members of KYTC even if the students couldn’t make it. Imagine the shock to the entire motor-racing world when Lola later went into administration. But let us hope there are other firms at the leading edge who are prepared to give bright and “inspirational” lads from the hell of occupied Palestine some eye-popping insights into automotive engineering excellence… and help bring them in from the cold. Will Palestinian ‘brass’ and media do better this time? Just to remind readers, the tiny coastal enclave of the Gaza Strip has been cruelly and illegally blockaded by Israel, with Western collusion, ever since Hamas won the 2006 elections and enforced their right to govern. The great democracy-preaching powers had no hesitation in strangling Palestinian democracy as soon as the ‘wrong’ side was elected. And they continue to use criminal methods like collective punishment to make life hell. KYTC (Khan Younis Technical College) was set up by UNRWA in 2007 to provide training for Palestinian refugees and inject skilled labour into the impoverished local economy. One of its courses is Autotronics, which includes diagnosis, maintenance and repair of automotive systems, injection and ignition systems, and electronics and electrical systems. In 2009 KYTC’s first Autotronics class, frustrated at the lack of workshop materials for hands-on automotive experience, set about building a race car from recycled parts. The following year the students went one step further and built a car conforming to exacting Formula Student standards, and 11 students eventually travelled to the UK to test their prized creation. Who were those remarkable young people? According to UNRWA many come from the sort of background the United Nations calls “abject poverty”, which means families who don’t have the financial resources to provide even the most basic necessities of life. And which means their achievement is all the more admirable. Any new attempt on the FS Formula prize will require a totally new car. Sadly KYTC seem unable to overcome the many obstacles imposed by Israel’s blockade and take another crack at it. Their prospects won’t have been helped by Trump’s spiteful funding cuts which are having a devastating impact on UNWRA’s schools and colleges. Hopefully the An-Najah team will keep the Palestinian flag flying with pride at Silverstone. A photo of their car hasn’t yet been released. The team has a problem finding funds and the difficult-to-obtain materials to manufacture the body shell, so the car remains in ‘bare bones’ form at present, hardly a thing of great beauty. It is sometimes forgotten that the West Bank too is under siege and lockdown, with nothing and nobody allowed in or out without Israel’s approval. So West Bank students also work under crushing handicap. The project supervisor at An-Najah University, Dr Mahmoud Assad, tells me the race car idea was dreamed up by him and one of his students while they both worked in Manchester UK. This time, hopefully, the youngsters will get the support they deserve from the Palestinian authorities, institutions and media. This article was posted on Monday, February 26th, 2018 at 8:32pm and is filed under Gaza, Israel/Palestine, Occupation, Science/Technology, Sports, United Kingdom.